Skin tends to get neglected over the winter – it’s either being exposed to cold, wet and windy conditions or covered up in clothes and dried out with indoor heating. It’s fair to say that many of your clients will come to you with their skin in a less than perfect condition in the spring, so offer them a complete refresh and renew package. The idea of renewal is a great one to tap into at this time of year and it’s easy to create added value packages that will encourage people to buy and continue making appointments. A top to toe spring scrub package is a lovely idea – exfoliating body scrub, foot and hand scrub/treatment and an exfoliating facial is easy to market and you can sell it on the premise of the amazing fresh, spring clean feel afterwards. You can add extras into your normal massage packages, too. Why not offer a reviving hand or foot scrub treatment free with a full body massage? Or a package of massage therapy designed to stretch under-used muscled ready for the challenges of spring activities? Have you tried offering a ‘make your own spa product’ service for your clients? Try it this spring – people love to learn new skills and if they perceive that they are getting something personal to them, which is also potentially saving those precious dollars, it’s bound to be a winner. You could offer pamper-style boxes containing all the ingredients for a salt scrub, soap or bath/shower product – or offer demonstrations where people get to take their own products home with them? If you give the product options some nice, spring-themed names too, you can tie them in with the season. You could even promote them as a perfect, unusual Easter gift. A spa party is another fun way to boost your massage or spa business. Invite people in for a mini-massage session and a selection of fruit teas/smoothies – or visit their homes and take a selection of your favourite products. Offer mini-facials and hand treatments with a selection of products and if you have samples, make sure that you take those, too. People lobe to try before they buy and if they can fall in love with a new skincare line, or exfoliating product and get to try a small amount, you can bet they will be back in for more once it’s all gone. While you’re coming up with ideas, why not have a spring revamp on your interior décor, and your website too? If you have the expertise, make a few changes to your website, add some spring products and a few blog posts talking about the best way to boost your health this spring. Get the 10 CE Bundle Spring Spa Package for 50% Off! 10 NCBTMB approved massage continuing credits for only $77. This Bundle includes three classes designed to make you more money with spa services: Massage Enhancements, Making Your Own Spa Products, and Making Money with Spa Parties. READ MORE & BUY NOW. 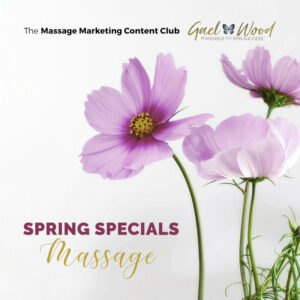 Massage and Spa Marketing Content Clubs! Enjoy done-for-you marketing content so you can focus on why you went into business in the first place: GREAT SERVICES! Previous post: How to Find the Time to Grow Your Business and Invest in Yourself! Hi Gael thanks for the beautiful blog on spring spa, It appears to be a lot of fun to try. I really liked your spa party idea very much, we may try this with our clients as well as friends. Keep posting such interesting information.